It’s not often that I’ll sit in front of a TV for 4-5 hours while the sun’s out on a weekend. But the power of Tiger Woods pulled me in, and I and millions of fans were rewarded with his comeback victory at The Masters, his fifth green jacket at Augusta and 15th major tournament golf championship. Tiger waited a long time for his return to the mountaintop. It was 11 years since his last major title, the U.S. Open, in 2008. It was 14 years since his last Masters win. He won his first Masters title in 1997 as a 21-year-old. He came off the 18th green and hugged his dad, Earl. 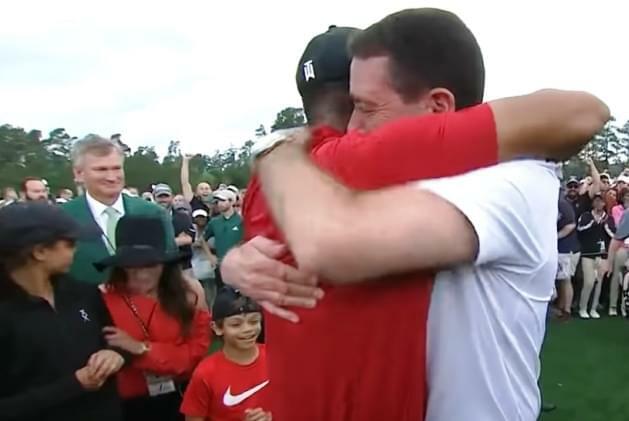 This year, the 43-year-old legend came off the 18th to hug his two kids, mom, girlfriend and his longtime agent, Richwoods High School graduate, Mark Steinberg (pictured above). This incredible comeback was really the last of a handful of comeback attempts that all fell short of returning Tiger to golfing prominence. He went from being unbeatable and on track to eclipse Jack Nicklaus’ 18 major tourney titles record to assuming that his career was over. His marital infidelities became know to all after a Thanksgiving argument with the wife and the accompanying car accident. He got divorced. He went on national TV to admit his short comings and said he wanted to be a good dad. His body began to breakdown on him. He has endured knee surgeries and – the injury that had him thinking he was done with golf a couple years ago – at least four back surgeries. He got a DUI while driving under the influence of pain killing pills, an addiction he picked up while suffering through years of back pain. He was mortal after all, just like the rest of us. We don’t have his game or fit body, but we can relate to the thinning hairline and other life problems he’s gone through. I admit to crying with my huskies in front of the TV yesterday when he came off the course to hug his family. It capped one of the greatest rise-from-the-ashes stories in sports. I mentioned Tiger in the mens hockey locker room a few hours later and was surprised to see that the majority of the guys hadn’t watched The Masters. Too bad, I’m glad I stuck with him. And now, talk can begin about whether he may catch the Jack Nicklaus record of 18 major titles after all. I and millions (billions?) around the world will be watching and pulling for him.